People aren’t sure about which battery to choose for their conversion of a conventional automobile into a pure electric vehicle (EV). They can either use a deep cycle lead-acid battery or a lithium battery. Let us now analyze whatever information we have about the batteries so that we take an informed decision. There are advantages and disadvantages for both these batteries. Some people are of the opinion that only a lithium battery can make an electric car work efficiently. Reputed car manufacturers are reluctant to produce electric cars because they aren’t satisfied with any of the batteries presently available in the market. In their opinion, deep cycle lead batteries, the one used on boats and marine crafts can work to some extent but not very efficiently. They say that lead battery can be used only for conversion of an old gas guzzler into an electric car and it will be a failure if it is used on large scale commercial production of electric cars. Seth Leitman, the author of Build Your Own Electric Vehicle book, on the other hand, is of the opinion that a lead battery is perfectly good for an electric car. Now let us find out whether lead batteries are the most suitable ones for homemade electric cars. If it is so, let us also find out what makes them more advantageous over lithium batteries. Lead batteries are cheaper compared to lithium batteries. An electric car which runs on 120V will require 20 batteries of 6V each. Each battery will cost something between $100-150. So the total expenditure on batteries will be just $2,000-3,000. Even if you are going to get the best quality deep cycle lead battery, the expenditure will be around $5,000 only. And if you take good care of these batteries, they will last for a number of years. If you buy lithium batteries, that is going to cost you upwards of $16,000 – $20,000. 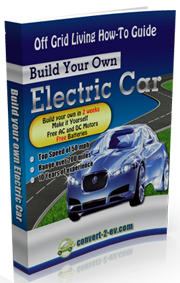 Do you have that kind of funds available for your DIY electric car conversion project? Most people don’t. Lead batteries are easily available because they can be bought from any local battery dealer. It means that you don’t have to spend extra money on its transportation. Transporting batteries will cost much because they are heavy and they must be properly packed since some of the metals used in their manufacture are toxic. Lead batteries are powerful and when you use them on your electric car, you can speed along the freeway, and even join a race. There is nothing to prove that lead batteries are less powerful than lithium batteries. The only advantage that a lithium battery has over a lead battery is its being lightweight. But remember its cost. They are 7 – 8 times costlier than lead batteries. Yes, it is partly true that lithium batteries have a longer life span. Lead batteries are safe to use. Whatever use you put lead batteries into, they are safer than any other batteries. Of course there are instances when the lead batteries leaked sulfuric acid when there was a car crash or produced flammable gases while they were being charged. These are very rare incidents and compared to other batteries, lead batteries are safe. Lithium batteries are more dangerous than lead batteries. They can burst into flames if there is a short circuit or if they are over charged. So lithium batteries need special care. Now you can decide for yourself which battery is the most suitable one for an electric car. Very vague. Lead Acid is good for 500 cycles max. Lithium Ion is good for more than 2000 cycles. That alone can make up for the price difference but the weight of lead acid is also a huge issue. 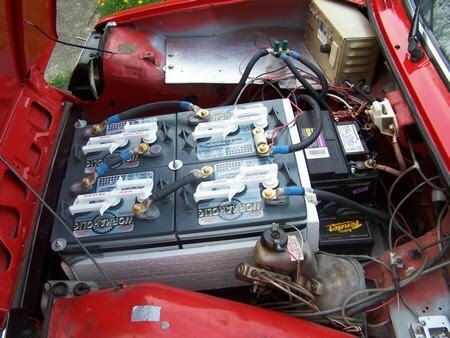 Large banks of lead acid batteries require suspension upgrades.